Proceeds from The Marathon We Live benefit the Every Step Counts Scholarship Program. Managing type 1 diabetes (T1D) is a challenge—especially for teens and young adults as they transition to independent care. Diagnosed with T1D at the age of ten, Boston Marathon competitor, professional cheerleader, and medical student, Courtney Duckworth, is familiar with this struggle. 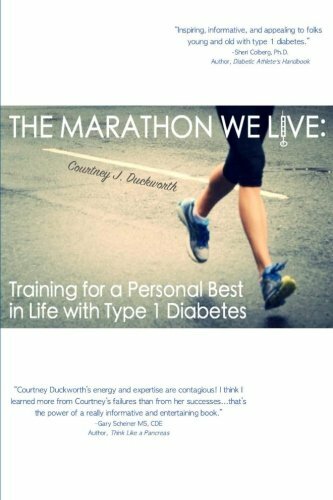 The Marathon We Live: Training for a Personal Best in Life with Type 1 Diabetes uses personal anecdotes, physiology, and research to describe how she applied lessons from marathon training to T1D management, bringing direction to her care, gradual improvements to her control, and benefits to areas of life that extend far beyond T1D. Through encouragement and sharing what she has learned, Courtney hopes others will be empowered to reach new personal bests in life with type 1 diabetes. Copies of the book can be ordered from Amazon. If you like it, please help us out and write a review! If you have suggestions about how to make the book even better, please contact us. More on the writing process can be found here. As always, your support means everything—thank you!